DayNa Decker makes some breathtaking Candles - i mean Chandels. What’s the difference? According to their site, it’s their patent pending wood wicks, which not only create mesmerizing wide flames, but also crackle like a wood fire. They are also handmade right here in LA! The come in a range of sizes, from the perfect size to line around your bathtub, to huge centerpieces, they will certainly set the mood. I’m personally most drawn to the layering of the black within the solid clear glass candle… see a plethora of images after the jump! Two things happened when the gorgeous lingerie of The Lake & Stars showed up on NotCouture… i wandered to their site, and fell for, perhaps simultaneously, the photography of Tim Zaragoza and their trench coats. While at the moment i’m not sure which one i’m more in love with, or if perhaps the combination is irresistible, i’ll let you know when i finally meet one of the coats in person, or find images of it alone. Brooklyn photographer, Zaragoza, has found the perfectly moody, mysterious, dramatic look for these ladies in the trenches with their felty looking shades… and The Lake & Stars have mastered the classic combo of beautiful lingerie, trench coats, and heels. See after the jump for more images i’ve dug up so far. p.s. What better name for a trench than - Opportunity? NOTCOT Note: Here’s another article from Anna Corpron of Sub-Studio! 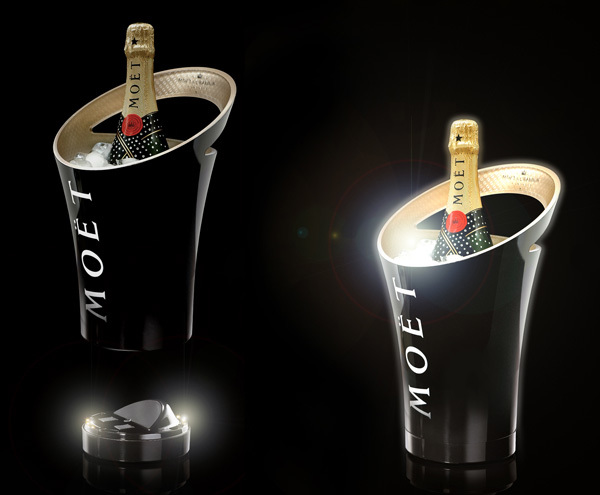 On new luxury collaborations for 2008, French designer, Jean Marc Grady, has designed a service accessory range for Moet & Chandon including buckets, drink cooler, bowl, candlesticks and platters. 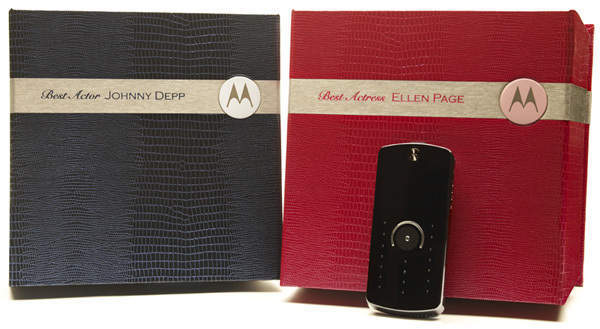 What struck me with this collection is the interesting integration of technology in the bucket. There is nothing to draw you right to a drink bucket in a dark night club like a sparkling bottle of champagne, literally glowing… and as soon as you pick it up from the base, the light stops. This one will certainly create quite the dramatic lounge experience, and between the black lacquered exterior and the reflective gold interior filled with shimmering ice and a bottle of Moet & Chandon, there is no way anyone will be able to take their eyes off it. More closeups after the jump ~ and unfortunately there are no pics of this one in the wild yet, but i’d love to do a photo/video shoot with it a lounge/bar someday! 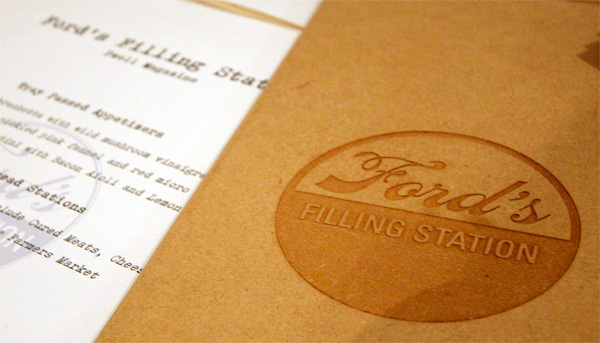 And to finish off my triple feature from the FORDBRADY Dwell party, i loved the typography and use of wood for Ford’s Filling Station’s menu board’s and branding. This Culver City restaurant, which turns two on Valentine’s Day, catered the event, and after the jump you can see more images of the incredible kitchen island at FORDBRADY, as well as some of the drool worthy food served! 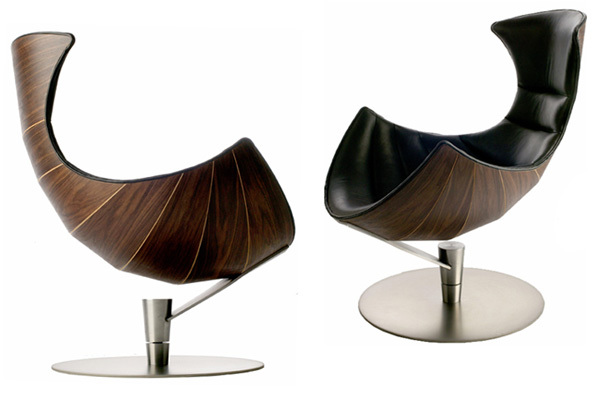 It’s incredible what can be done with raw silkworm chrysalises. 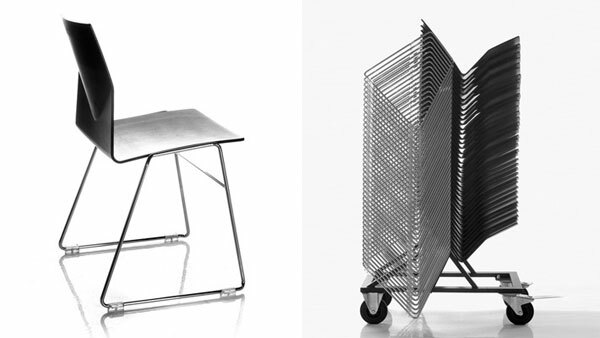 While at FORDBRADY last week for Dwell’s cocktail party, i was immediately drawn to the work of Angus Hutcheson. 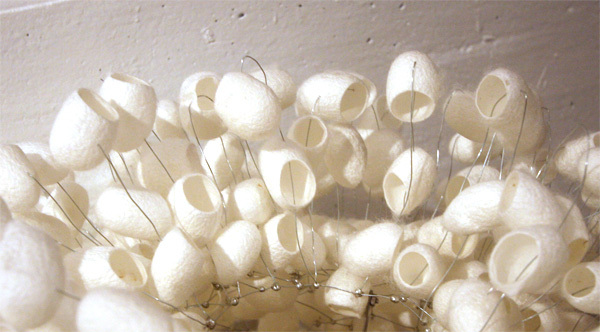 He creates some breathtaking lighting pieces by wiring up hundreds of silk worm cocoons for wall, floor, ceiling, and table lamps, which come in both white and black, and the natural variation in the cocoons creates such a mesmerizing effect, particularly when casting fabulously dramatic shadows. 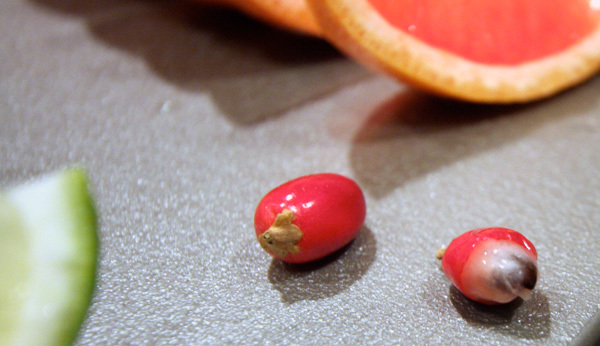 The only thing that i couldn’t help feeling was… what if they missed one! What if one of the moths was waiting to emerge… and found myself peering into all of the tiny chrysalises. Images below of the lamps, as well as a roundup of from Angus’ collection. Roundup time! Trying something new again ~ i LOVE the roundups, i think its such a nice way to get a condensed speedy overview of what’s been going on across the curated user submissions sites (NOTCOT.org, TasteSpotting, and NotCouture), but i’ve been finding myself quite torn. I just don’t love the look of NOTCOT.com being cluttered with so many roundups on the front page at one time… yet there is so much awesome stuff on all the sites, i can’t bear to pick one of the three… anyhow, so here’s the new idea. Above you see three rows of 5 of my favorites across the sites! And after the jump you can see the top 24 from the last week of all three sites! So as always: Click the pics to find out more! 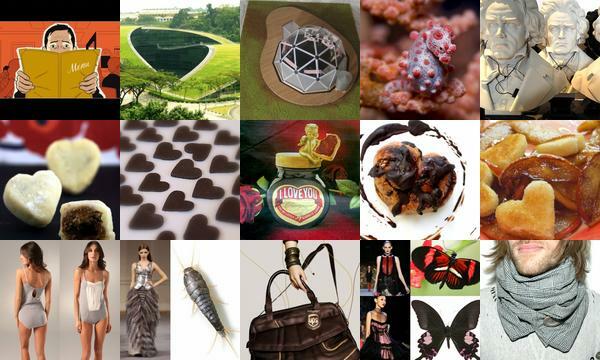 and yes TasteSpotting’s row is themed for people who might need some Valentine’s inspiration. 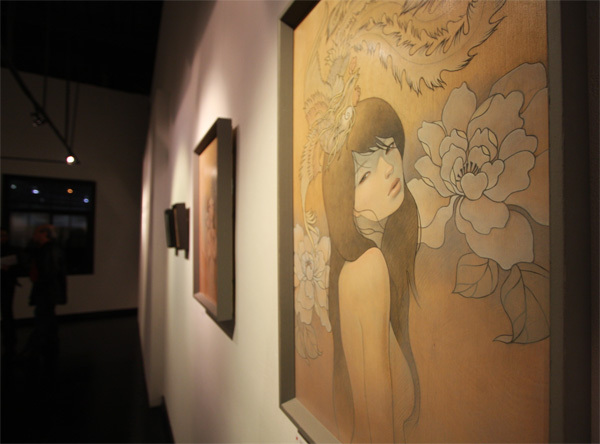 Audrey Kawasaki has done it again with her latest series of beautiful paintings for her solo show, Mayoi Michi, that debuted tonight at Copro Nason in Bergamot Station. To see what i saw… check out my pictures from “Mayoi Michi” in the gallery. Noteworthy, this “it” girl has certain made it huge… all pieces from her show were completely sold out before the opening, and most going for about $10,000-12,000, so a big congrats to Audrey! Also looks like it’s going to be a busy year for her, with a solo show in sept in Rome (at Mondo Bizarro), group show in november at ThinkSpace, and even a solo show planned for July 2009 at the Jonathan Levine Gallery in NY! View my pics of the show here, and Audrey’s closeups of each piece here. I’ve wanted a black viewmaster since the “Gifts for your Indie Ninja” list from my ThisNext days, but alas, i’ve been lazy and forgot to buy one… so when i saw that the latest issue of Arkitip, No. 0044 HIGHMATH ~ is a collaboration with one of my favorite Danish collectives, Wood Wood… and comes in a box with “1 Exhibition catalog, 3 image reels, 1 3D viewer”… i grabbed my credit card. 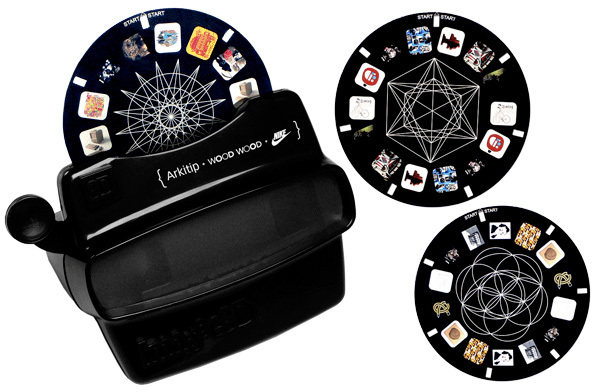 How could i give up a chance at a black viewmaster (with white Arkitip, Wood Wood, and Nike branding) as well as fun art? Perhaps we need to get some branded NOTCOT Viewmasters, and every month/week/random whim we can send out a mysterious reel of inspiring imagery? On Thursday night i stopped by FORDBRADY’s cocktail party for Dwell Magazine, “Los Angeles meet Dwell” where they announced the Dwell on Design Los Angeles Conference and Exhibition event in Los Angeles as well as launch the new look, “environmentally friendlier” Dwell magazine. 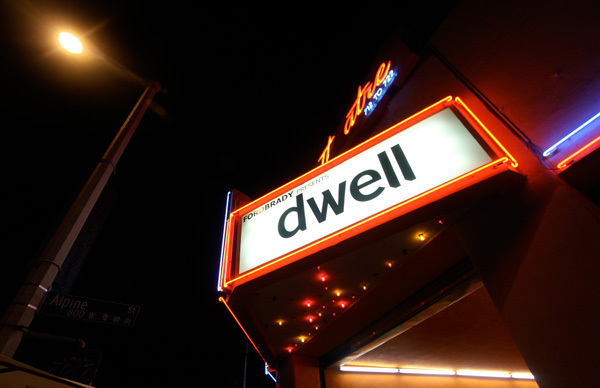 On June 5th and 6th, it looks like Dwell is looking to start some friendly competition with CA Boom. What was truly fascinating about the event was the incredible space that FORDBRADY occupies. Their downtown showroom (and home to Willard Ford, his fashion designer wife, Michelle Yu, and teenage son) is set in the historical Chinatown Kim Sing Theatre ~ which was built in 1926 as a vaudeville house, and served as a cinema from the 40’s until ‘86 when it was abandoned… only over years of work, and with the help of Xten Architecture, they’ve turned it into an incredible loft/gallery space, with a gorgeous courtyard… really an unexpected modern oasis in Chinatown once you step under the original marquee and through the brilliantly orange entry tunnel. Check out their Interior Design Magazine feature for more details and images. After the jump see many pictures of the incredible space as i viewed it at the party! blu_ray ~ the latest collection from CARGO Cosmetics. And yes, that blu_ray. If the beauty industry has anything to say about it, it looks like blu_ray really is winning the war on HD DVD. 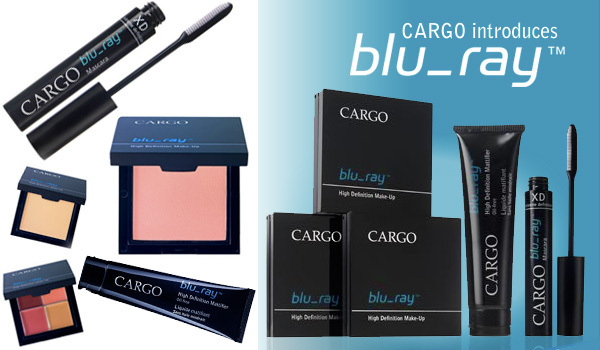 The CARGO site says “blu-ray, CARGOs revolutionary new collection originally created for make-up artists filiming in high-definition, is designed to provide flawless results while maintaining a perfectly natural look. Because life happens in High-Definition…” So i guess anyone can be ready for their closeup in microscopic high-definition when viewed from a blu_ray dvd? I’m surprised that the 59$ (valued at $130) complete set doesn’t come with a blu_ray disc to help give buyers an extra push towards a ps3/blu_ray player… also i’m surprised to not see examples of with/without the magical blu_ray makeup as would be seen in high-definition. See the full collection after the jump!